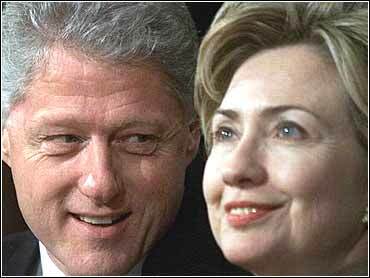 Six years and more than $50 million in taxpayer money later, an independent counsel has concluded there is "insufficient evidence" to charge President Clinton and First Lady Hillary Rodham Clinton with any criminal wrongdoing in the Whitewater land deal in Arkansas. "The invesigation in connection with Madison Guaranty / Whitewater matter is now closed," said Independent Counsel Robert Ray on Wednesday, hours after releasing his written statement on the matter. The White House immediately cheered the outcome as New York voters are just seven weeks away from deciding whether to elect Mrs. Clinton to the U.S. Senate. Ray will send a final report under seal to the court that appointed him, detailing the findings and the investigation into the original allegations that prompted the most expensive independent counsel probe in history. "The office determined that the evidence was insufficient to prove to a jury beyond a reasonable doubt that either (the) president or Mrs. Clinton knowingly participated in any criminal conduct," Ray's written statement read. When asked for reaction, White House press secretary Joe Lockhart told reporters he's using "every ounce of self-restraint right now." He added that the president had "a sense" about what the conclusion of the probe would be. Lockhart said he'll leave it up to the American people to decide if the probe was a "useful exercise." For Mrs. Clinton, the independent counsel's findings were better for her New York Senate bid than one of those big campaign contributions. "I'm confident that not only New Yorkers and Americans made up their minds, but that there's nothing to report," said the first lady when asked for her reaction. New York political observers seemed to agree that Ray's statement will probably have little - if any - impact on the Senate race, while CBS News Legal Consultant Andrew Cohen said Ray "applied the correct legal standard, as all prosecutors must, that a case which cannot be won at trial should not even be brought." Cohen added Ray's statement is "pretty standard stuff" and "good news" for the Clintons, "it is interesting for what it does not say." "It does not say that there was absolutely no evidence whatsoever against the Clintons and it does not rule out the possibility that the Clintons may have unintentionally or unknowningly done anything wrong - and I think the Clinton's political opponents are likely to seize on those points." And those opponents will likely seize upon one paragraph in Ray's five-and-a-half page statement. That's where the independent counsel noted his office had "experienced delay caused by the White House and others involving both the production of relevant evidence and the filings of legal claims that were ultimately rejected by the courts." Ray made that same point over the summer when he issued his finding on the White ouse travel office firings. Ray's investigation began in 1994 under his predecessor, Kenneth Starr. At the heart of the probe was the Whitewater land deal, a failed Arkansas real estate venture involving the Clintons in the 1980s when the future president was the state's governor and the future first lady was a partner in the prominent Rose Law Firm in Little Rock. The independent counsel's office had probed whether the First Couple had committed any criminal offenses, including perjury or obstruction of justice. With the release of Ray's statement, the only loose end left in the Whitewater probe are appeals involving former Arkansas Gov. Jim Guy Tucker's criminal case. Ray's findings on Whitewater are among four different investigations he has been wrapping up. In June, Ray found "substantial evidence" that Mrs. Clinton played a role in the purge of the White House press travel office. She swore to congressional investigators in 1996 that she had no role in the decision to fire the employees. In March, Ray concluded there is no credible evidence of criminal activity in the White House's improper gathering of hundreds of FBI background files of former Republican appointees. Ray's final task will be to decide whether to seek an indictment of the president after he leaves office for alleged perjury and obstruction in the Lewinsky scandal. A new grand jury was impaneled July 11 to consider the matter. "It's ironic that the president's potential legal troubles relating to the Lewinsky investigation would outlast, if you will, his legal troubles over Whitewater - which of course started it all," said Cohen. And so, Wednesday's announcement closes the book on the investigation into the failed Arkansas savings and loan owned by the Clintons' Whitewater real estate partners, Jim and Susan McDougal. The McDougals were convicted in a 1996 fraud trial stemming from the collapse of the S&L, which cost taxpayers more than $60 million. Jim McDougal died in prison and Susan McDougal served a year and a half behind bars for refusing to tell a federal grand jury whether the president testified truthfully in the case. Mr. Clinton swore that he knew nothing about a fraudulent federally-backed $300,000 loan to the McDougals that they never repaid. When prosecutors finally got to question Mrs. McDougal last year for the first time, she said more than 40 times that she did not recall various business deals related to Whitewater and the failing S&L, asserting that her husband had handled most financial matters. The Whitewater investigation of Mrs. Clinton focused on legal work she performed on a fraud-ridden land development called Castle Grande owned by Jim McDougal and Little Rock businessman Seth Ward, the father-in-law of Mrs. Clinton's law partner, Webster Hubbell. An indictment accused Hubbell of concealing his and Mrs. Clinton's legal work on Castle Grande. Mrs. Clinton's role in the project was reveaed in 1996 when her law firm billing records mysteriously turned up in the White House family residence under circumstances that have never been explained. Whitewater prosecutors had subpoenaed them two years earlier. Hubbell pleaded guilty to a felony in the case a year ago, but maintains that Mrs. Clinton engaged in no wrongdoing. Mrs. Clinton's billing records disclosed that she prepared a real estate document valuing a parcel of Castle Grande property at $400,000. The federal government got just $38,000 for it six years later following the S&L's collapse. Federal regulators concluded the S&L used the document prepared by Mrs. Clinton to deceive bank examiners about hundreds of thousands of dollars in commissions paid to Ward. Questioned about her work for the S&L, Mrs. Clinton said on 99 occasions in a two-and-a-half hour interview with federal regulators in 1996 that she was unable to recall it. The billing records reveal that Mrs. Clinton and Ward spoke at least 15 times from mid-November 1985 to June 1986 about Castle Grande and other business related to McDougal's S&L. Mrs. Clinton and Ward said they didn't recall the conversations. Ward died this year. The Clintons have criticized the Whitewater probe as politically motivated. They grew embittered in 1996 when Whitewater prosecutors summoned Mrs. Clinton for questioning before a federal grand jury, the first time in the country's history a first lady had been subpoenaed in a criminal investigation. Early this year, Mrs. Clinton expressed impatience with Ray's office, saying "I think everyone would have expected that ... after six-and-a-half years, thousands upon thousands of documents and investigations and committee hearings, that they would have reached their conclusion." Even Michael Chertoff, who was the Republican legal counsel for the Senate Whitewater investigation that ended four years ago, was critical of the Independent Counsel's office taking so long. "I think the time to have perhaps fish-or-cut-bait on this was back in 1997 or 1998," Chertoff said. "I don't know that much was gained by going on for two more years. I'm sure there was a lot of uncertainty and pain that was caused by protracting it and maybe that the lesson here is that the result was too late in coming." As for Kenneth Starr, the former counsel who spent most of the money was asked on Wednesday to justify the record cost of the probe, but he only passed the buck to the man who replaced him. "I think you should address those questions to the Independent Counsel," said Starr, referring to Ray.